Also known as my WAG sweater. I don’t have a pattern, though I do have charts for the color work. Left is the sweater body; you can see a vertical stripe interrupting the pattern where the sleeve will be. Right is the arm hole “steeked,” cutting the knitting to create a sleeve hole (in this case, I’ve also steeked cardigans after knitting them in the round). The name and color scheme is because my calendar for 2018 was different shots of the Aurora in Norway and Iceland and it inspired me. Some of the yarn is hand spun, some is commercial. I am at a point where my enthusiasm has outrun my reasoning skills for the moment. Now I have to sit down and do the math to center the patterns on the caps of the nonexistent sleeves as well as do the calculations for centering the neck and sewing the shoulder seams – and how many stitches to pick up for the sleeves as well. Nah. Not today. It’s a nice day. I’m going to go outside and fix stuff in the chicken yard. I can do the math later. When I first sat down at an antique wheel it was as though something ‘clicked’ in my hands. My hands knew what to do before my brain caught up. I suspect something like spinning, a skill with such a long history, is carried in genetic memory. While I can’t speak for my ancestors, who may very well have hated the task, I can say that spinning gives me comfort, a time to meditate, a peaceful space in which to contemplate everything and nothing. What I have been doing with my extra brain bandwidth. Or, Reindeer Games. I have not been knitting much the past month or so, no time thanks to OfficeAlly, our EHR program. Which SHOULD be named OfficeEnemy. Or OfficeOpponent. I lose work every single day and find myself having to waste large spans of time on tasks which should be easy but aren’t. Every time I click on a medicine to enter it I have to wait for the page to reload which take 30-45 seconds. And it is not very user friendly because of this. The autosave has been responsible for me losing more work than any other single feature of the program. Plus it bumps us off several times a day and you have to waste precious time logging back in, going back into where you were, and redoing everything you just lost. Honestly paper is so much faster. And yes, I realize this is a pretty awful photo. Sorry, my photography skills seem to actually getting worse rather than better. The brim does not roll, and if I can get a photo on an actual model tomorrow I will try to post that. Our camping trip was amazing. We met some people, including someone (who shall remain nameless) that I never in my wildest dreams would have imagined meeting at a little tiny camp out in Northern Arizona! We also met several Arizona heathen families, some wonderful New Mexico heathens, along with a fellow mead maker/brewer, and lots of other people, all of whom were talented and giving of their time and skill. It was, all in all, a lovely weekend. We got an incredible amount of rain! Mr. TF and I were married in Grand Caymen during Hurricane Michelle in 2001. I don’t think I’ve experienced sustained rain with winds like what we had on Friday since we were in the hurricane! People’s tents got filled with 2 feet of water! A few tents collapsed! We were luckier – we were camped out farther from the common ramada, but on not such a steep slope and thus avoided some of the problems others had (and that was purely by chance, I assure you). We did get water in the tent, but it was because the wind was blowing the rain horizontally and it lifted the rain shield, allowing rain into the tent. Not so bad, though. Only one half was actually wet (with about an inch of standing water in places) but most of our stuff was still in the plastic totes and thus dry. Most importantly, our bedding remained mostly dry (yay wool!) and we were cozy every night. I took not a single picture. In fact, our phones remained either in the truck’s glove box or charging with the solar charger on the hood. We were pretty much technology free during our 3 days there. I didn’t miss it much either. I did notice I had missed a phone call from someone very important when I finally picked up my phone around 10pm on Friday night – luckily said person also sent an email and I spent an agonizing 15 minutes trying to sign into my email and waiting for his letter to load…but it was good news and well worth waiting for. Mr. TF and I drank two drams of scotch each (LaPhroaig) to celebrate, and sat outside in the beautifully clear night, watching the meteor shower and the stars. Other than sharing the good news with family and close friends the next day though, no phones for either of us. I did NOT win the antler handled, hand forged skean dhu I had hoped to bid on….I was too busy running my mouth visiting and missed the auction for it entirely! Ah well, not meant to be I guess. There will be others. All the crap that has gone on since January…if it all hadn’t gone down the way it did I never would have met any of these people, at a time and a place in my life when I really NEEDED to meet them. I humbly apologize to the Universe. Things do in fact happen for a reason. And sometimes wyrd/karma takes really some really strange twists to get us where we are supposed to be and in contact with those we are supposed to know. But now, home for nearly a week, I am like a caged panther. I’m not particularly good at waiting. But wait I must. I guess the Powers are making sure I get some actual rest time in before I start my new job with its associated stress and all consuming lifestyle (if my fellow workers are any judge, that is). Maybe some time to knit while I pet the cat…. Or knit while I chat with friends…. Or knit while I get this amazing craphole of a dirty house back into shape 🙂 Are you sensing a pattern here? Of course, I also have wool tweed on the loom I need to weave off to make a vest with, and POUNDS of alpaca and wool to spin up – including a commission for lace weight suri yarn. Yep, waiting is hard, but I think I might be able to fill my time. In the Shetland Islands, knitting is known as ‘makkin.’ Hence the name for my belt. 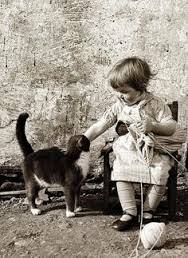 You see, most production knitting used ergonomic methods that allowed women (and men, and children) to knit quite quickly, with even tension, and allow knitting while walking or caring for family tasks. In the Shetlands, this involved a knitting, or makkin belt. It’s worn with the large part on the side, and a double pointed knitting needle (pin, as they’re known in the UK) is inserted into the belt at an angle that allows the needle to remain stationary and enables the hands to maintain a more ergonomic position for a longer period of time. It also keeps the wrists more or less out of the motion of knitting, which greatly reduces the risk of over use injury. I purchased the leather, the awl set, the leather needle, and rivets at my local leather shop. Unfortunately, for whatever reason, I could only get one of the rivets to stay and “grab” the belt so it’s sewn at the other end. It was a lesson for next time. The belt was already made, purchased at the thrift store for something like 50 cents. It’s stuffed with a surprisingly large amount of tulle, as horsehair – the traditional stuffing, while available – was extremely expensive. I know, it’s not especially pretty, but I’m hoping it will be functional. ETA: I used graph paper to sketch out the basic shape and traced it onto the leather. It’s approximately 8″ long, and 3″ wide. I used the 1/8″ diameter awl bit to make the holes for the lacing. I ‘eyeballed’ the holes both for the lacing and for the needles; I didn’t have a tiny awl for small diameter needles so I used a T pin and made those holes; the larger ones are made with a hand punch awl of an unknown diameter. They are randomly placed on the surface. 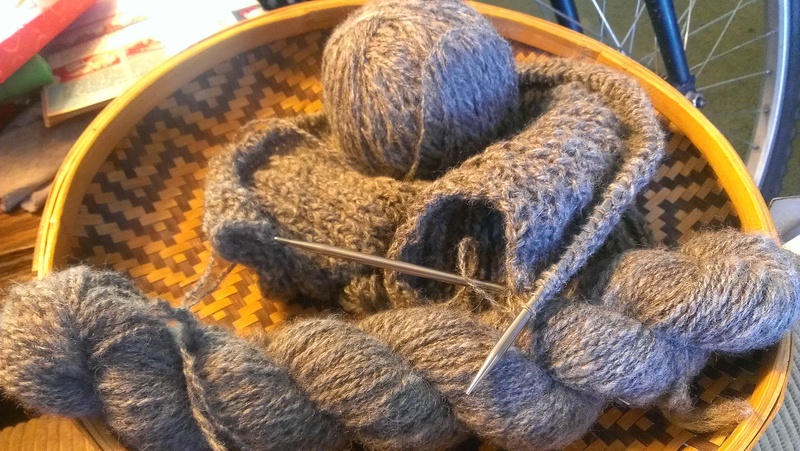 I have noticed lately that knitting causes me to have pain at the base of my thumb near where it joins the wrist whenever I knit for more than an hour or two – even if I am a good doobee and get up and stretch every hour. I currently have a very large collection of circular needles that I’ve accumulated, because I find they are easier to carry around and use wherever I go. The alteration in my style when I use them, however, causes the pain due to my wrists turning more to flick off the stitches. I have decided that if I am ever going to be a production knitter I need to become MUCH faster than I am. I’m no slouch right now, but I really want speed without sacrificing quality. When I knit with single point needles, I have always naturally braced one against the crease of my thigh or into a pillow next to me, which allows me to knit faster and more ergonomically. I have no idea where I first learned this, but my paternal grandparents were from Ireland so I may have seen Irish style knitting at a very young age and simply copied my grandmother without realizing it (she passed away a long time ago, I have no real memory of her other than her asking me if I understood – in Gaelic). Using a knitting belt is a natural extension of my instinct, that will allow me to knit in other places than my couch – and to take it with me anywhere I go. I did try lever knitting, where the needle is held under the arm, and that hurt my wrists very badly very quickly. This is a video of Isolda Teague using a knitting belt. It is probably the most clear in the placement of the belt and the use of the needles that I have seen. I haven’t tried it out yet, but I am anxious to do so on some sort of project that can be appropriately hidden (like socks) until I get the hang of it. I suspect that in times to come, when hand made becomes a necessity once again, this will be a good skill to know and to pass along. And I have enough leather left over to make another belt as well. It’s almost like the longest gestation in history. I have completed my clinicals. I will complete my paperwork today. I take my final exam for my final class tonight. I began this journey 37 months ago. After all this time to be done, to have only the board certification exam to stress about, seems very very odd. I’ve been so stressed for so very long now. I lost interest when it got to the seaming part. For a weaver I surely do hate sewing. BUT. It MUST BE DONE by 9am Christmas Eve, so I can wrap it, because it is being given later in the morning! Gratuitous photo of Shetland singles for weaving. Not enough to make anything but a scarf, so it shall sit in my stash until I buy another Shetland fleece and spin more. I read in a Starmore book that Shetland is too fragile for weaving; I plan to challenge that statement and report back. ETA: click on the photos for a better look. Handspun lovely rose grey squishy soft baby alpaca? Check. Knitting needles? Check. Pattern to go with the yarn? Nope. I’ve started two sweaters in the past three days (one is still on the needles in the photo) and both need to be frogged which is knitter speak for ripping out. 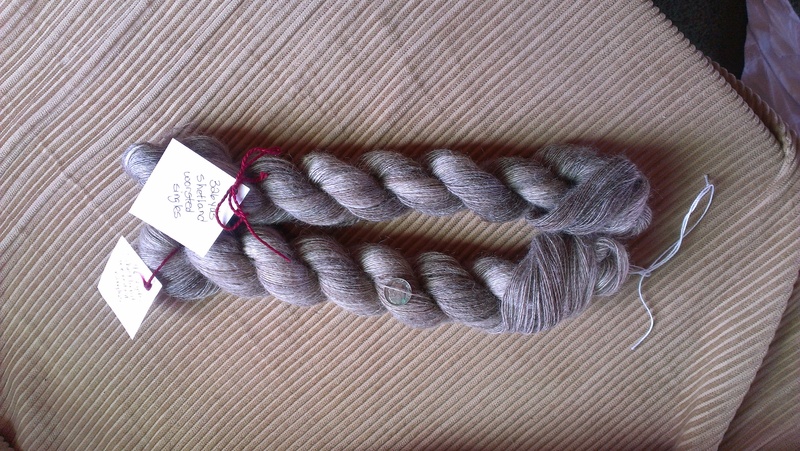 It turns out that my hand spun alpaca is not, as I thought, a sport weight, it’s most definitely either a heavy DK weight or a light worsted weight. AND. Alpaca, it turns out, has no memory. So the sweaters I started, will not keep their shape. They will grow. Which will be bad. The first sweater I started had a lovely drape, which would have taken into account the stretch factor, but I’m not going to spin and ply 1800 yards of this stuff before it’s due to be given! And the body of the sweater was quite drapey but the sleeves looked distressingly tight on the models which concerned me enough that I ripped it out. The second sweater was working up nicely in the ribbed section at the waist, but when I started on the body I realized there was no way a light weight 2 ply was going to work with a sweater designed for a heavy worsted 10 ply yarn. Nope. Knitting you can see through just doesn’t work unless you’re knitting lace. So, back to square one. Another two hours wasted surfing patterns at Ravelry yielded exactly nothing that I thought my intended recipient would care for. Lots I would wear, but this time of year I can’t possibly knit for myself. I have custom knitting for pay, gift knitting for loved ones and no time to knit for myself, not even socks. 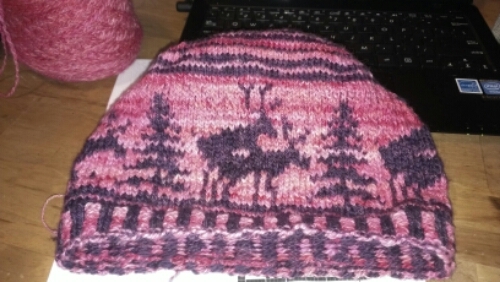 Then I remembered a pattern I had purchased last year. I searched Ravelry for this pattern made with alpaca. And found a quite lovely example that proved it could work. So. Enter Hitofude. Lacey, light, drapey and yet slim and stylish, perfect for alpaca. Win. Now I’d better get ripping so I can get knitting! Oh, and find my size 4 circulars…. Wool has to be soft…? This is hand spun, hand dyed wool from local sheep. It’s reasonably soft, being a Jacob/Merino mix, but not the softest thing I’ve ever felt by a long shot. Who cares, right? Well, this yarn is for sale on consignment at a local yarn shop. When I was last in there, several women were feeling it and commenting that it wasn’t very soft. Then they asked me why the alpaca yarn was so much softer. I never got the chance to answer, because then they realized it *was* alpaca. Now, I’m not a fan of really scratchy wool. I don’t know anyone who is, except perhaps people who weave carpets. But because I buy raw fleece from a variety of breeds, and process it myself or send it to my friend Rita at Arizona Fiber Mill, it is not processed by using chemicals to burn the vegetable matter out of the fleece. This preserves the inherent softness. It gets plain old soap and really hot water, just as it’s basically been done for hundreds – thousands – of years. Though to be fair in some regions urine was boiled to wash the wool. Urine actually is a pretty powerful antimicrobial cleaner, believe it or not. The active ingredient is ammonia. But back to the title of the post. As a hand spinner, I spend a lot of time with fiber. I want my finished product to be beautiful, functional, and above all durable. 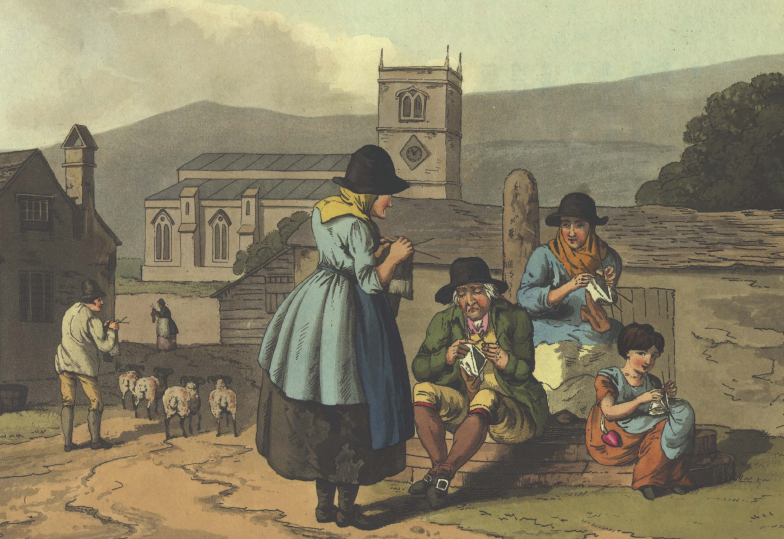 There are many types of sheep who produce many types of wool. ALL of these sheep were developed for specific purposes. And until recently, those purposes had to include not only meat, but fiber as well. Want a durable carpet? Don’t use merino wool! Use the outer coat of an Icelandic, or Lincoln, or a primitive fat tailed sheep variety such as is found in carpet producing regions like Pakistan or Turkey, or Iran. Want great long lasting socks that stay up? Again, don’t use merino! Use Dorset down, which in my opinion is far and away the springiest and most resilient wool and excellent for socks. Want a blanket or a jacket? Use Cotswold. Spun worsted, it makes the ideal weaving yarn. Want a really soft yarn for a scarf or a hat? OK, now use merino. But be aware that it probably won’t last for years and years, not if it’s spun to current standards. Industrially spun yarns are not very tightly spun nor plied. It give a softer hand to the yarn, but it will pill and make your hard work look quite bad in not a very long time. It’s even worse in a sweater unless it’s spun with something like silk. I’m not anti-merino. It’s a wonderful type of crimpy fleece that is pleasurable to spin. BUT. Because I can spin my own, I choose to spin a slightly ‘harder’ yarn with more twist than you will see in commercial yarns. This is because I want my yarn to pill less and last longer in good condition. The above Jacob/merino cross is a perfect example of what people don’t understand about wool yarn now days, because our mass produced industrial society encourages overconsumption and throw away items. This apparently includes hand knit items, because the only thing most knitters I know who don’t spin look for is “soft wool.” OOH, it’s so soft!! When I hear how soft a yarn is I automatically picture the product pilling and being discarded after a year or two. This yarn pictured is actually pretty reasonably soft, because the wool itself is medium soft and because it’s spun to preserve a reasonable portion of the ‘soft’ factor. ETA: after I re-read the above paragraph this morning I realized I should include how it’s spun to clear up the apparent discrepancy between saying I spin a ‘harder’ yarn and spinning to preserve its softness. 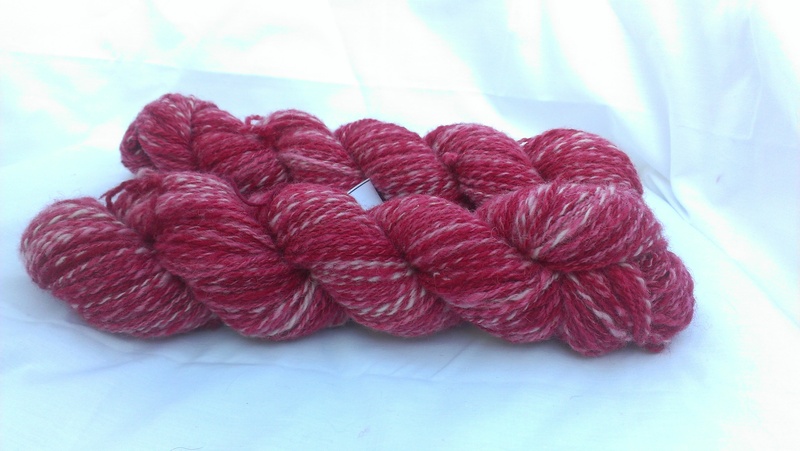 I spun this particular yarn in a semi-woolen manner. Meaning, I spun it using a modified long draw (picture my arm drawing way back like I’m going to pitch a ball, only I have wool in my hand and a twisted single going into the spinning wheel as I draw back. When I bring my arm forward, that single gets taken up onto the bobbin). This is what gives the fluffy and soft aspect of the yarn. I spin from carded pin drafted roving when I do this which gives the semi-part of the semi-woolen. It’s not quite full worsted (firm and durable) and not quite true woolen (really fluffy and soft, not durable at all). As I said, my yarns have more twist in the singles to start with than a lot of commercial yarns do, so even my softer stuff will hold up better than an equivalent commercial yarn. In older times, people weren’t so concerned about “soft” because they knew they were sacrificing durability for softness. If they put a wool item on as a warm layer, they usually had something like linen underneath. No one had time to reknit something just because they wanted another one. Things got worn until they were past mending any more. As a hand spinner, my outlook is much more closely aligned with my ancestors’ than with current standards. I want soft, yes. But in small quantities for specific uses. Otherwise, I want durability over soft. It takes me about a week to wash and comb enough fleece to begin spinning yarn for socks. I make a 3 ply yarn when I make sock yarn, so I spin up 3 four ounce bobbins worth of singles. Then I ply them all together to make my 3 ply yarn. I lose a bit in length by doing a 3 ply because they are circling around themselves in a larger diameter than in a 2 ply, but I also get much better resistance to wear by doing so. A round yarn wears better than a flat one. You want this for socks. It takes me approximately 5 hours to spin 4 ounces of singles at the thin diameter appropriate for making a nice thin sock yarn. Before I’ve even begun to ply I’m already at 15 hours of time at the spinning wheel. Plying takes another 3-4 hours. Then I have to wash it and set the twist. If I’m going to dye it now is the time, which takes another day for dyeing and drying. I’m now approximately 40 hours into these socks, and I haven’t even begun knitting yet! I can knit a regular crew length sock in approximately 5 hours. So it takes me 10 hours to knit a pair for myself. 50 hours worth of work is a lot of time to invest in an item! From my 12 ounces I can knit 3 pairs of socks for myself, 2 pairs for a man, or 1 pair of kilt hose. And this is why I won’t use merino for hand spun socks. Not only does it tend to pill, but it felts VERY easily. Which is something you do NOT want in a pair of socks, because felting shrinks them too. Dorset doesn’t felt very well in my experience, at least when it’s spun true worsted (all the fibers aligned in the long ways direction). It’s a similar process for a sweater. The average sweater requires a pound of wool. And for a woman, approximately 1200 yards of yarn. That’s only if it’s color work or plain knit. If you are doing a lot of cables like an Aran sweater, you need closer to 3 pounds of wool, and 1600 yards of yarn. 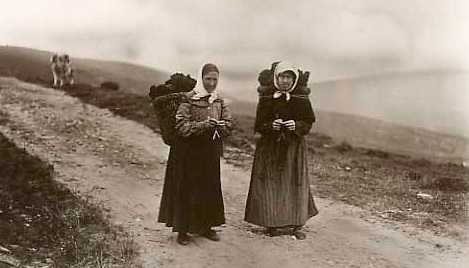 Regardless of what you may have read about Aran sweaters being a traditional garment, the plain fact is that they weren’t in common use until well after the industrial revolution and most women were no longer spinning their own yarn. No one is going to invest that much time into spinning the yarn for that kind of sweater when they are knitting for their entire family. So soft…? Only sometimes. Mostly I prefer to sacrifice a little softness in favor of durability. But then, I’m a very practical person. What about you?